Another spell of extreme discomfort is being experienced by those who live around the major metro areas of the Northeast on Sunday as hot temperatures and elevated humidity levels combine to send the heat index into the danger zone. The heat will continue into Monday from parts of southern New England southward into the mid-Atlantic. By Tuesday, much of the worst heat will be squashed southward into the mid-Atlantic region due to a cold front. On Saturday, Washington, D.C. tied a daily record high by reaching 101 degrees. This was the first 100-degree day there since July of 2012. The heat index maxed out at 114 degrees during the afternoon. Our nation's capital also tied its warmest low temperature on record for the month of August Friday and Saturday by only dipping to 81 degrees. New York City saw a maximum heat index of about 110 degrees Saturday, though the actual high for the day was 96 degrees. 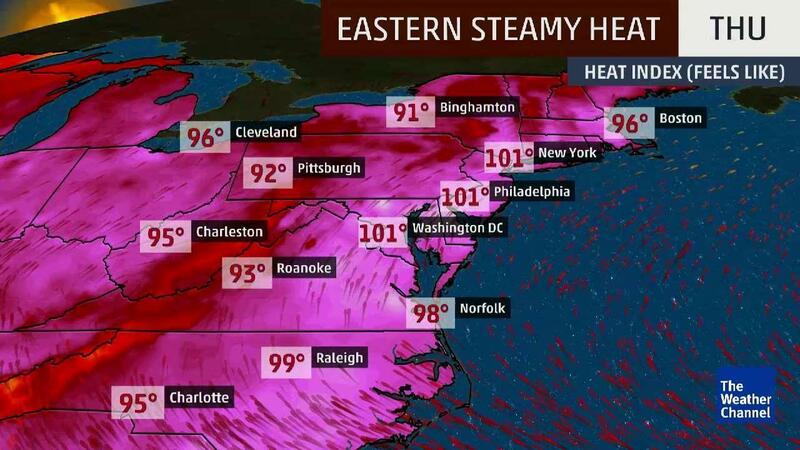 The National Weather Service has issued various heat alerts, including heat advisories and excessive heat warnings for parts of the Northeast, including Boston, New York City, Philadelphia and the Baltimore-Washington D.C. area. Washington D.C. and Philadelphia will see high temperatures in the mid-90s through Monday. An excessive heat warning is in effect for the metro Philadelphia area through Sunday, where the heat index (how hot it feels) could approach 110 degrees in the afternoon hours. Baltimore and Washington D.C. are under an excessive heat warning again on Sunday. Heat index values of 105-110 degrees are expected during the afternoon hours. Both of those locations will continue to see hot temperatures in the 90s to start the new week Monday into Tuesday. An excessive heat warning is in effect for the New York City metro area through Sunday evening. High temperatures in New York City are expected to reach the mid 90s, and the heat index could range from 105-110 degrees in the afternoon hours. Temperatures will trend somewhat cooler on Monday with highs in the low 90s along with less oppressive heat index values. For the Boston metro area, temperatures will soar to the mid 90s on Sunday, with heat indices above 100 degrees. Boston will also see cooler temperatures move in Monday into Tuesday, as compared to Sunday. The National Weather Service has published some heat safety tips. Job Sites: Stay hydrated and take breaks in the shade as much as possible. Indoors: Check up on the elderly, sick and those without air conditioning. Outdoors: Limit strenuous outdoor activities, find shade and stay hydrated. Vehicles: Never leave kids or pets unattended - "look before you lock."